We aren’t in Kansas anymore, Toto. On our way to St. Louis we stopped by the Capitol building in Jefferson City. Yet, another capitol building being renovated when we visited. We parked along the side of the street and took up several parking spaces per the lady I talked to at the visitors center. As we were trying to get back on the highway GPS failed to tells about closed road so we got stuck in a situation that we had to unhook the Jeep and Chris worked his magic maneuvering the RV in the right direction with just a small tree branch scratch. This was our first scratch and hopefully only. Luckily it only removed the wax layer so Chris was able to re-wax it and it’s as good as new. We stayed at 370 Lakeshore Drive in St. Peters, MO. This is a really nice park, it’s empty this time of year. We had hoped for nicer weather so we could have enjoyed the miles of bike trials and the lake for kayaking. Unfortunately, this is the coldest temperatures we’ve had in the last 14 months! We only saw the sun twice on our two week stay here and had two horrible storms, complete with tornado sirens! Taking a picture of the sun because it was a rare sighting. Abby received this special gift from her friend Arianna and loves to move the vehicle across the magnetic United States plate. Cute, huh? The Gateway Arch National Park is officially the smallest National Park in America. It occupies 91 acres. Hot Springs National Park in Arkansas (where we are headed next) was the smallest until this one was completed last year.The arch was completed in 1963 but the addition of the museum operated by the National Park system was just completed. The arch is a memorial to the pioneers that forged westward. We have seen the end, middle and now the beginning of most of the pioneer trails. This thing is enormous! We watched the film on how it was constructed ($3 each) and were left with a feeling of awe. I highly recommend watching it before you go up to the top of it. I had hoped to have better weather one day so we could come back and take better photos but it just wasn’t in the cards. Views from on inside the top and outside underneath. 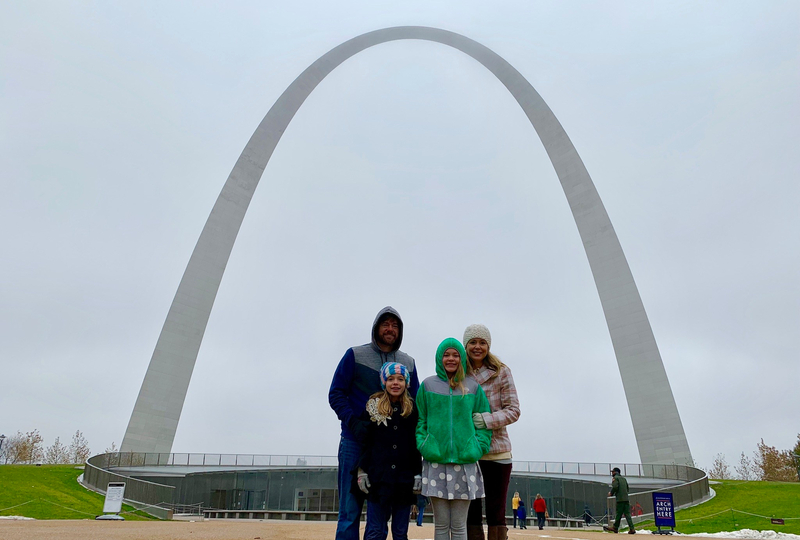 We bought tickets online to go up the arch at 11:00am. We rode up the North side of the arch in a tiny round capsule that only fits 5 people, so we had a private ride. It felt like a space capsule. There was a great view of the city from one side and the other side you look down on the Mississippi River. The girls remembered that Percy Jackson had jumped from the Arch into the Mississippi River from the book The Lighting Thief. Being up inside the top of the arch made that connection click. Within walking distance is the Old Courthouse where Dred Scott was denied the freedom he so deserved. The Supreme Court ruled that African Americans were not and could never be citizens of the United States and that the Missouri Compromise of 1820 was unconstitutional. The decision pushed the country closer to civil war. Dred Scott did finally get his freedom, but not through the courts. After he and his wife were later bought by the Blow family, they were freed in 1857. Scott died of tuberculosis in St. Louis the following year. Harriet Scott lived until June 1876, long enough to see the Civil War and the Thirteenth Amendment (1865) abolish slavery in the United States. The girls earned both the Gateway Arch and the Old Courthouse Junior Ranger badges. The park system does such a great job incorporating history, math, science and art into these books. On the way home from the Arch we visited the Golden Arches just because it was fun to say. We found a really nice theater called B&B to watch the newest Fantastic Beast movie. #HarryPotterfans! They had the best leather reclining seats we’ve seen. What a great movie! One night we ate dinner at Fratelli’s so we could try toasted ravioli because it’s a thing here. Toasted Ravioli was first created here in St. Louis. I tried a new apple pie recipe that Southern Living published in their latest issue that I saw at the library this week. It is a recipe from the BBQ restaurant next to my sister’s apartment in Asheville, NC. It was delicious! Mackenzie and I also tried a Pinterest idea with fruit kabobs and a pumpkin pull apart bread (we didn’t like this). My cousin, Matt, that I grew up with in Maryland lives here with his family.Matt and his family hosted Thanksgiving at their house this year and invited us. I haven’t seen him in around 13 years so this was the first time the girls have met these second cousins. The kids got along beautifully and we had great conversation. I am so thankful for extended family! I hope we get to see them more often! Thank you Matt and Kelli! This was my favorite part of this stop! I wish we could have spent more time together. We had to go see the world famous Budweiser Clydesdale Horses that we’ve seen in commercials for years. They live in a beautiful historic stable built in 1885. There is a chandelier hanging in the stable that was built for the St. Louis World’s Fair of 1904. Anheuser Busch offers free tours of the stables and brewery, which includes 1 free sample along the way and a free full size beer (or soda) from the bar when you finish. The Anhueser-Busch Brewery is one of the largest and oldest breweries in the nation. The St. Louis location is the largest and oldest of the 6 locations they own. It was chosen based on its access to the Mississippi River and the natural cave formations that were used to store beer before artificial refrigeration. We took the complimentary 45 minute tour but you can pay for longer tours. We learned about the entire 7-Step Brewing Process, the brew kettles and Beechwood Aging Cellars. We ate lunch in the Biergarten. I tried the Budweiser Brat and Chris had the burger with Budweiser BBQ sauce. This is the coolest place ever! It’s a cross between a junk yard and a jungle gym. They don’t have maps because you are suppose to just explore and boy did we! It’s not just for kids, Chris and I had fun also. Some parents were walking around with knee pads and headlamps…obviously they are regulars. There are 3 floors inside this old industrial building filled with slides and caves. We really got our exercise with a 10 story slide! Outside you will find 3 stories of slides, tunnels and a castle. Then there is a roof top amusement park which is closed during the winter. We need one of these in Atlanta. I love social media- the benefit is essential to keeping in touch with family and friends. Another benefit is that a friend that you went to high school with and you haven’t seen in 25 years sees that you are in their town on Instagram and sends you a direct message. Result- you get to meet for lunch! Shawna, I’m so happy you reached out, just in the nick of time! Getting to see family and friends in the same week made me so happy! When in St. Louis, eat at Saint Louis Bread company- AKA Panera! We found a nice library system in St. Charles County where we visited two of the libraries to work from. We were able to get a temporary card so we could check out books this week. We arrived Sunday night and found a drop off location for our Samaritan Purse shoe boxes for Operation Christmas child. When we dropped off our shoeboxes we met sweet ladies from the ministry at First Baptist Church of St. Charles. They invited us to join them Monday to volunteer with them. We also tried a new place for lunch- Pretzel time. Yummy! By staying at the RV park we were able to get a card to use the Rec Plex, which is like YMCA on steroids. They have an indoor leisure pool with vortex and slide. They also have 3 diving boards in the regular pool. There is also an Ice skating rink in the Rec Plex. We enjoyed this on cold rainy days while here in St. Louis. There are a ton of free things to do in St. Louis, including the Science museum. They have exhibits inside that are additional fees but because of my ASTC membership- we got planetarium tickets free. We really wanted to see the show about the Moon so we checked the schedule and it was playing on the day we were picking Chris up from the airport so it worked out perfect. The planetarium was fantastic, it’s the first one we’ve been able to lay on mats and watch. The presenter was great with the girls, telling jokes before it started. There were several space exhibits surrounding the planetarium that Mackenzie loved. There is a skybridge that goes over the freeway that connects the planetarium to the museum. On the skybridge there are glass panels on the floor that the girls loved standing overtop of. The Museum had a new exhibit all about gaming, which included cool virtual reality stuff. Chris flew home to Atlanta for business one of the two weeks we were here so we did school work in the RV for that week. He brought back a gift from a dear friend. Thank you Pamela! December 1st we gave the girls their traditional Star Wars Advent Lego Calendar. Side note- Gas prices here were $1.98 per gallon! The Zoo here is free also but we never made it because of the weather. Wow Wow Wow – what an amazing adventure and experience. I have a lot to catch up on – you’re a year into your trip at this point. Hi Suz! Thanks for following!